I did it, I did it... wooo hooo I did it! I finally got a knife to turn out the way I wanted. (for the most part anyway...) Check it out. It's my new squirrel knife. It's got some brass pins (1/8") and a thong tube (1/4") and generally.... I like it. How cool is this? I made the knife I get to carry when I hunt next season. Oh man... I am stoked now. I've been at it with the Lanskey for a while getting things sharpened up. The tip is really pointed well and the base of the blade is so sharp you can get cut just looking at it... Still some work to do though. If you find yourself wondering, "Should I spend three or four hundred dollars on that fantastic custom knife I saw on the bladeforum.com site or should I go another way?" and if you have any incling for working with your hands, you want to read this book. Knife making is unlike anything I have attempted as a hobby. It is profoundly simple in its principles and challenging in every respect of implementation and the results are immadiately gratifying and lasting. This book can really provide some real insight about techniques and saftey that I found to be very helpful. It is easily worth the money for the info contained. In converse, it does not go into details of steel or heat treating so you may want to look for other info sources on these things. 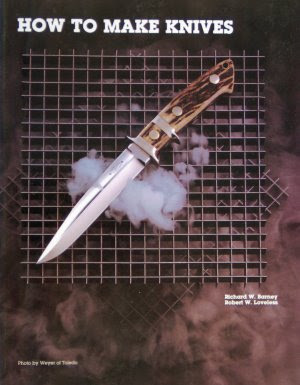 However, all in all, great to read and really solid info from a great knife maker. Readability - 5 of 5 - For a non-fiction, how-to book this reads very well. Editing - 5 of 5 - All the words are spelled right and all the picture references match the text and the pictures themselves are helpful. Good stuff. Subject Matter - 5 of 5 - Only because I wanted to know about this and it is RW Loveless. Did I like the story - 5 of 5 - Absolutely, sort of. It's not really a story. In terms of how-to though, this is good stuff. If you're looking for a review of the techniques and methods employed in making knives, this is a good book and place to start. The Loveless method produces a real result and can serve to augment existing practices as well as providing insight into a legendary mind. Instead of 3/16 which, it turns out, make a knife that feels durable but heavy as can be, this one uses 1/8 O1. This time, instead of ironwood, I used ebony. And this time, instead of 3 mosaic pins I used two and they are smaller. I also added a thong hole. Still, just one more knife. This is way cheaper than building rifles and for the most part, it is more fun. I am feeling way short on words tonight. I don't really have more to say. I am tired and pleased that this is done. I missed a few glue oozes but otherwise, I am pleased.